In Jim Crow America, it's no wonder that Jack Johnson was the most despised African-American of his generation. The first black boxing heavyweight champion of the world, Johnson humiliated white fighters and flaunted his affection for white women, even fleeing the country after an all-white jury convicted him of "immorality" for one of his relationships. Now, more than 100 years later, Johnson's great-great niece wants President Donald Trump to clear the champion's name with a posthumous pardon. And she has the backing of Sen. John McCain, who has supported a Johnson pardon since 2004. "Jack Johnson was a boxing legend and pioneer whose career and reputation were ruined by a racially charged conviction more than a century ago," McCain said in a statement to The Associated Press. "Johnson's imprisonment forced him into the shadows of bigotry and prejudice, and continues to stand as a stain on our national honor." 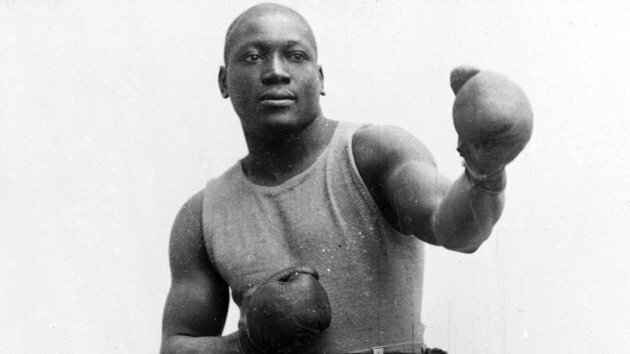 Johnson, the son of former slaves, defeated Tommy Burns for the heavyweight title in 1908 at a time when blacks and whites rarely entered the same ring. He then mowed down a series of "great white hopes," culminating in 1910 with the undefeated former champion, James J. Jeffries. In addition to his flashy boxing, Johnson refused to adhere to societal norms, living lavishly and brazenly and dating outside of his race in a time when whites often killed African-Americans without fear of legal repercussions. In 1913, he was convicted of violating the Mann Act (also known as the White-Slave Traffic Act), which made it illegal to transport women across state lines for "immoral" purposes. The criminal charges sprung from a relationship he started with his future wife Lucille Cameron, an employee at Cafe de Champion, a mixed race nightclub he opened on Chicago's South Side. After seven years as a fugitive in Canada, Europe and other countries, Johnson eventually returned to the U.S. and turned himself in. He served about a year in federal prison and was released in 1921. Cameron and Johnson eventually divorced and Johnson died in 1946 in an auto crash in North Carolina, supposedly after racing angrily from a segregated diner that refused to serve him. The stain on Johnson's reputation forced some family members to live in shame of his legacy — the exact opposite of how Johnson led his life. Family "didn't talk about it because they were ashamed of him, that he went to prison," Linda E. Haywood, a 61-year-old Chicago resident, said of her great-great uncle. "They were led to believe that he did something wrong. They were so ashamed after being so proud of him. The white man came and told them that he did something wrong, he did something dirty and they painted him out to be something that he wasn't." Haywood has pressed to have Johnson pardoned since President George W. Bush was in office, a decade ago. Posthumous pardons are rare, but not unprecedented. President Bill Clinton pardoned Henry O. Flipper, the first African-American officer to lead the Buffalo Soldiers of the 10th Cavalry Regiment during the Civil War; he was framed for embezzlement. Bush pardoned Charles Winters in 2008, an American volunteer in the Arab-Israeli War convicted of violating the U.S. Neutrality Acts in 1949. "In terms of Jack Johnson, I think the Department of Justice came back recommending — not recommending a pardon on that," press secretary Robert Gibbs said in 2009. A spokeswoman for Obama declined further comment. Haywood wants the history books rewritten. "Knowing that he was treated unfairly and unfairly convicted and targeted because of his choice of companions, who happened to be Caucasian, that's wrong," she said. "It bothered my people to the point they didn't even want to talk about it. My mother didn't even want to talk about it. That's stupid ... It bothers me. "The last thing you want to do is die and have your name tarnished. That's wrong. You don't want it to be tarnished if you're living."